Our Wentzville MO orthodontist thinks that it is fair to say your toothbrush is the superhero of your oral hygiene! Your toothbrush allows you to brush twice a day and gently scrub away food particles, plaque, and bacteria. By scrubbing effectively, your toothbrush helps ensure you a lifetime of healthy smiles. Considering how important your toothbrush is, it is important to keep it clean and store it wisely! Luckily, your toothbrush is a rather low-maintenance appliance in your bathroom. Toothbrushes can be placed in most areas without a cause for concern, but our orthodontist in Wentzville says to consider these do’s and don’ts next time you place your brush. Your toothbrush will dry faster in open air than it will cooped up. Try to limit your use of a toothbrush cover to when you travel, and opt for a free-standing holder at home. Storing your toothbrush in a medicine cabinet is fine if it is a cool, dry space with enough ventilation to allow timely drying. Bacteria grows faster in moisture, so steer clear of stuffy spaces to keep your brush as clean as possible. Our Wentzville orthodontist recommends storing your toothbrush at least 4 feet away from the toilet if possible. When you flush the toilet, germs can become airborne through an aerosol effect. You do not want this residue settling on to your family’s toothbrushes, so keep them at a distance. The same can be said for the sink. Splashing from sink water can launch germs from the sink onto toothbrushes as well. If your bathroom has few options for toothbrush placement, consider placing raised shelving on your sink or walls. Your toothbrush holders may not be the first thing you think of cleaning as you tidy up the bathroom, but consider making it a priority the next time you clean. Because of the daily traffic your toothbrush holders experience, it can be easy for bacteria to buildup. 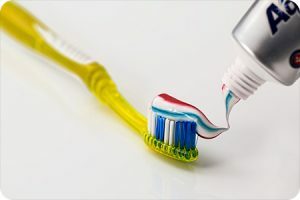 Regularly disinfecting your toothbrush holders and travel covers will help to ensure your toothbrush helps you minimize bacteria in your mouth rather than contribute to it. Do You Have a Great Tip to Storing Your Family’s Toothbrushes? Let Our Wentzville MO Orthodontist Know! The information provided in this article is not meant to be medical advice and is for educational purposes only. If you would like to learn more about this and other topics related to orthodontics, feel free to contact Borello Orthodontics, with a convenient orthodontic office location near Wentzville MO , by clicking here or by calling 314.821.2400.